Eleven years ago, when Dr. Paula Schreck became director of breastfeeding support services at St. John Hospital and Medical Center here, she grew concerned about her black patients. Unlike the white and Latina women she was treating, they weren’t as readily initiating breastfeeding, which studies have proven to be healthier than using infant formula for mothers and babies alike. Detroit’s Mother Nurture Project connects black mothers with peer breastfeeding counselors who offer support. Determined to achieve healthier outcomes for her patients (90 percent of whom are black and 85 percent of whom receive Medicaid, the government-funded health insurance for low-income Americans), Schreck started reaching out to African American health activists for help and advice. Together, they connected with community, corporate and government groups, forming innovative partnerships. They ferreted out money whenever they could find it, forming a patchwork of grant funding to launch, starting in 2011, a series of new breastfeeding programs that serve St. John’s patients. After establishing those programs, they began addressing a racial disparity among health care providers that was contributing to the overall racial disparity in breastfeeding rates. They hired African American women to become breastfeeding peer counselors and started training them to become skilled lactation consultants. As a result of this collaborative, out-of-the-box approach, Schreck, her colleagues–and their patients–have overcome the odds. Today at St. John, 68 percent of black mothers now initiate breastfeeding. “That’s nearly double what the number was before we started,” says Renee Pearson, one of three African American breastfeeding peer counselors now working at St. John. Pearson is earning a bachelor’s degree in health services administration while her work at St. John helps her gain the skills and credits needed to become a certified lactation consultant. Thanks in large part to the support she has received at the hospital, she is among a small but growing number of black women who are seeking more advanced training in breastfeeding medicine. To drum up ideas that would create stronger support for breastfeeding among St. John’s patients, Schreck didn’t work in isolation, but instead studied the example of successful health care initiatives. Some were small scale, local programs, such as the Mother’s Milk Club at Rush University Medical Center inChicago, which offers breastfeeding support groups to women of color. Other models were global endeavors, such as the Baby-Friendly Hospital Initiative, which was founded by theWorld Health Organization and the United Nations Children’s Fund and establishes stringent breastfeeding standards for hospitals across the globe. Schreck consulted Detroit groups such as CareLink, the Parish Nurse Program, the Detroit Regional Infant Mortality Reduction Task Force and The Detroit Urban League. Many of these initiatives are staffed and headed by African Americans. Scientific literature proved peer support was key: 2009 research in the Journal of Human Lactation showed black mothers who attended support groups were twice as likely to breastfeed as those who did not. Other studies showed people of different ethnicities were significantly more receptive to receiving health information when it was delivered by someone with whom they identified–someone who looked like them, talked like them, and was in their same peer group. Part of the disparity in black women’s breastfeeding rates could also be attributed to inadequate maternity health care. Hospitals in areas where the percentage of black residents was above the national average of 12 percent were less likely to promote early initiation of breastfeeding, give obstetrics patients breastfeeding supplements and to have new babies “room in” with their mothers, found a 2014 report by the Centers for Disease Control and Prevention. “There are racial disparities in access to maternity care practices known to support breastfeeding,” noted the study’s authors; a determination also made by Women’s eNews in a 2013 report on the failure of hospitals in black neighborhoods to support breastfeeding. Concluding that a stronger sense of community and improved hospital care were the keys to spurring change,Schreck and her colleagues at St. John moved to launch Mother Nurture, an innovative program pairing new mothers with black breastfeeding peer counselors who meet them one-on-one and in support groups. Since a collaborative effort led to its launch in 2011, Mother Nurture has served as an example of collaboration in action. When it hired its breastfeeding peer counselors, Mother Nurture relied on partnership with the Special Supplemental Nutrition Program for Women, Infants and Children, or WIC, a government program that offered the initial, two-day training for Mother Nurture’s peer counselors. Next, Mother Nurture sought to give its breastfeeding peer counselors more in-depth training. For this, it collaborated with the Detroit-based Black Mother’s Breastfeeding Association, which helped Schreck and her colleagues launch the Mother Nurture Lactation College in 2013. Through this program, breastfeeding peer counselors can move on to become certified lactation consultants. This highly-skilled designation puts those who earn it in a supervisory position. Granted by the International Board of Lactation Consultant Examiners, it requires between 500 and 1,000 hours of hands-on training, a year’s worth of college classes on anatomy, physiology and other medical subjects and 90 additional hours of lactation-specific education. Both the peer counseling and lactation consultant programs involve further collaboration within their ranks. Here, black mothers brainstorm about how to address challenges: a baby who won’t latch on; a husband or boyfriend who is critical of breastfeeding in public; or a grocery store that tempts women away from breastfeeding by offering free bags of diapers with infant formula that is bought in bulk. Working together, women learn about breastfeeding’s benefits and spread the word to their wider communities. Dalvery Blackwell, co-founder of the Milwaukee-based African American Breastfeeding Network, says community building like this may be the most effective way that health care providers can address racial disparities in nursing rates. Collaboration is key, affirms Schreck. “We’re collaborating not just in terms of the way we design our programs, but in the way we fund them, too.” In other words, funding comes from several sources at once. Mother Nurture’s first substantial grant came from a funder also in Michigan; the W.K. Kellogg Foundation, located in Battle Creek. It was for $1.2 million and helped sustain Mother Nurture from its launch in 2011 through the year 2014. Funding from Kellogg–which also supports projects at Women’s eNews–continues today in the form of two grants (one for $500,000, one for $750,000, and both slated to continue through 2016). Also lending support are the Ronald McDonald House of Charities, the Comerica Foundation, Blue Cross and Blue Shield, the National Association of County and City Health Officials and other funders that together offer grants totaling $100,000 and slated to last through 2017. On top of private grants, an additional 20 percent of Mother Nurture’s $500,000 annual budget comes from the state or federal governments, which work with Schreck and her team to help fill the remaining funding gaps. Four years since its launch, Mother Nurture has succeeded in better meeting its patients’ needs. It now has a “breastfeeding boutique” where patients can obtain nursing bras, breast pumps and other supplies; an obstetrics clinic staffed by lactation consultants; and a program that ensures breast milk is provided to infants who are treated in the neonatal intensive care unit. For these and other accomplishments, St. John was deemed a “Baby Friendly” hospital in 2014–a designation achieved by less than five percent of U.S. hospitals. Thus far, Mother Nurture’s lactation college has helped one African American woman become a full-fledged lactation consultant: Stacy Davis, who now works at Providence Hospital in Southfield, Mich. The program is currently training two other candidates, and hopes to welcome two more in late 2015. Mother Nurture’s policies are having an impact on the wider Detroit community because St. John is a large hospital that oversees 3,500 deliveries annually; because it lies within a system of five hospitals that oversee a total 9,000 deliveries per year; and because elements of Mother Nurture are being replicated system wide. Still, health activists at the Mother Nurture program and elsewhere say that much more work still needs to be done to expand the kind of work Mother Nurture does and reach more women. The most recent statistics indicate that in Michigan, only 16 percent of women exclusively breastfeed at the six-month mark, one of the lowest rates in the nation (Michigan ranks 33 out of 50 states in this regard). Another concern is the still-pressing need for more lactation consultants who are African American. Black breastfeeding peer counselors fill a vital need, say health advocates. But having more of them is no substitute for having more black women playing oversight roles as certified lactation consultants, managing maternity wards and shifting those institutions in a more culturally sensitive direction. “We need more women from the African American community put in more charge here,” says Schreck. 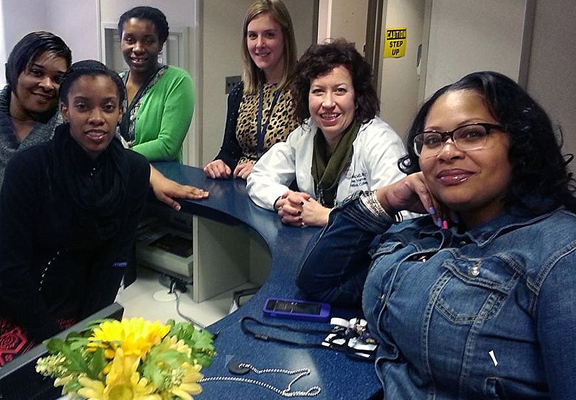 In the entire state of Michigan, only six black women are certified lactation consultants. In Detroit itself–where there are more than 688,000 residents, 83 percent of whom are African American–the total number of black lactation consultants is just two. Valerie Rochester, director of programs for the Black Women’s Health Imperative in Washington, D.C., says health advocates need to drum up stronger community support and more generous scholarships for African American women who are seeking to become certified lactation consultants. This series was partially funded by the Solutions Journalism Network. Molly M. Ginty (http://mollymaureenginty.wordpress.com/) is an award-winning reporter who covers the environment and health for Women’s eNews. This entry was posted in UPDATES on June 25, 2015 by detroitbranch.